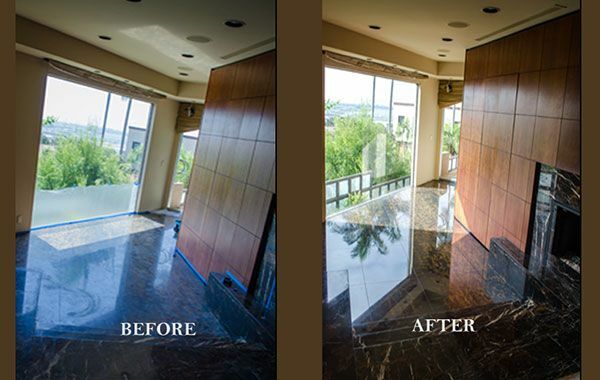 In a beautiful home overlooking the San Diego Airport, Harbor, and Bay, this Black Marble floor had lost its shine and luster. It had a dull hazy appearance that detracted from the overall elegance of this large, upscale bathroom. First, we protected the surrounding area, as we do with every job. We honed the marble. Our marble honing process removes the thousands of tiny scratches that give the floor a dirty, hazed appearance. Then, we polished the marble. Our marble polishing process restores the super smooth, glass-like appearance to the stone’s surface. Finally, we sealed the floor to protect against future damage. As you can see, comparing the before and after images, the quality of our work is second to none. We consistently produce dramatic results that exceed the expectations of our clients. If your marble floors, countertops, walls, showers, or other surfaces need to be repaired, rehoned, or repolished, contact us online or call 619-246-0240 today to schedule residential or commercial marble services.